Saudi Arabia announced today it had dealt a body blow to Al-Qaida gunmen who have terrorised Western residents of the kingdom, by killing their alleged chief Abdul Aziz al-Muqrin, and three comrades as well as arresting 12 others. A file image taken from an Islamist web site shows a hooded man purported to be Saudi Al-Qaida leader Abdul Aziz al-Muqrin who has been reported killed on Friday. Grieving over their loss, relatives of an American hostage beheaded by militants in Saudi Arabia hoped for privacy as they decide what to do next, according to a family spokesman. A file photo of American engineer Paul Johnson, who was beheaded by Al-Qaida militants on Friday after holding him hostage for a week. A US soldier was killed in a firefight with insurgents near the Iraqi city of Baquba, a US military spokeswoman said today. “A 1st Infantry Division soldier died on June 18 after anti-Iraqi forces engaged his unit with small arms fire at about 7 pm (8:30 pm IST) near Baquba,” she said. 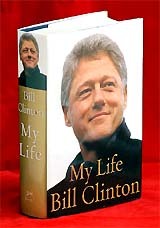 A copy of "My Life," the new autobiography by former US President Clinton, is seen in New York on Friday. In the book Clinton writes that his affair with a White House intern revealed "the darkest part of my inner life." He said the sexual relationship was immoral and foolish. Four hundred foreign construction workers in Singapore say they’ve gone without pay for most of this year as their employer faces a cash crunch, a news report said today. President George W. Bush has selected 12 persons, including Pope John Paul II, to receive the Presidential Medal of Freedom, the White House announced. Two of the recipients will be honoured posthumously, while the others are invited to receive America’s highest civilian honour at a White House ceremony with Bush next Wednesday. The Interior Ministry said the four were shot dead by security forces in Riyadh last night, shortly after “Al-Qaida in the Arabian peninsula” posted grisly photos on websites showing the beheading of American aeronautics engineer Paul Johnson. The victim’s severed head was placed on his back. 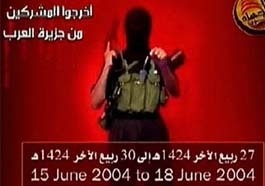 “Abdul Aziz bin Issa al-Muqrin, who claimed to head the gang of ‘takfeer’ (holding others as infidels) and bombings and issued statements (claiming responsibility) for assassinations and kidnappings” was one of four gunmen shot dead last night, said an Interior Ministry statement read on state television. The four “were besieged in a gas station in the Al-Malaz district in Riyadh by security forces, and a heavy exchange of fire” ensued, it said. The television showed photos of the bloodied dead bodies of Muqrin and the other slain militants. The statement and footage came after a communique in the name of Al-Qaida was posted on an Islamist website denying that the network’s Saudi chief had been killed. Meanwhile, an Islamic militant website today denied reports that the Al-Qaida leader claiming responsibility for the killing of US engineer Paul Johnson had been killed in a fight with the government forces. Earlier, Arab broadcaster Al-Arabiya had reported that Abdulaziz al-Muqrin was killed in a gunbattle. The beheading of Johnson provoked condemnation by US President George Bush. He called the killers “barbaric people” and said the USA would not back down in the global fight against terrorism. The government of Saudi Arabia chose to make its first official confirmation of the killing in the US capital, symbolic of its growing unease over escalating terrorist attacks in its own country and concern over its public image in the USA. The haunting image of a living blindfolded Paul Johnson, 49, and the pleas of his family for mercy became familiar to global television audiences over the past week. But yesterday, the ordeal came to an end. At a grim, solemn news conference, Adel al-Jubeir, Saudi Foreign Affairs Adviser to crown Prince Abdullah and a longtime fixture in the Saudi Embassy in Washington, confirmed Johnson’s “brutal murder” and “gruesome death”. US officials confirmed that Johnson was beheaded, media reports said. Al-Arabiya early today reported that 10 suspected militants connected to the Al-Muqrin were arrested in Riyadh. The USA Government has urged all Americans to leave Saudi Arabia due to a spate of attacks aimed at them. But Al-Jubeir disagreed with the advice, saying Saudi Arabia doesn’t “support moves like this” because it is giving terrorists what they want. He said Johnson’s body was found in the northern part of Riyadh. It “could be possible” that the aeronautics engineer had been killed earlier in the week, he added. With uncommon harshness, Al-Jubeir condemned Johnson’s killing as a breach of the Islamic faith. The Saudi official said a gun battle was underway in Riyadh and a “number” of terrorists had been killed, but he could not confirm that was connected to Johnson’s killing. He said the security forces were “engaged in a siege in the Al-Malazz area of Riyadh. The family of Paul Johnson Jr. released a statement yesterday praising US and Saudi authorities for efforts to rescue him. Johnson, 49, was kidnapped last weekend by militants who followed through on a threat to kill him if the kingdom did not release its Al-Qaida prisoners. An Al-Qaida group claiming responsibility posted an Internet message that showed photographs of a beheaded body. Hours later, Saudi security forces tracked down and killed the leader of the terrorist group, according to Saudi and US officials. Johnson had worked in Saudi Arabia for more than a decade and his friends and family had described him as devoted to the culture of his adopted land. French President Jacques Chirac said he was “horrified” by the beheading. 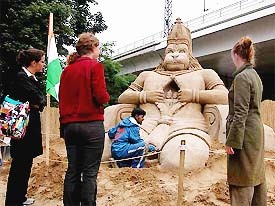 He denounced the act as beastly, inhuman and shameful. “I am horrified by the beastly methods that are very difficult to describe because they are at the complete opposite of everything we consider respectable as humans,” Chirac said at a summit of European Union leaders in Brussels. “I can only express the shame that we all feel faced with the behaviour coming from human beings of this nature,” he added. 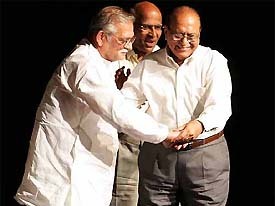 UN Secretary-General Kofi Annan said, “These kinds of brutal acts do not help anybody.” “My sympathies go to his family and loved one, and I hope the perpetrators would eventually be brought to justice because we cannot tolerate this kind of behaviour in today’s world,” he said at the UN Headquarters in New York. In Amman, the Jordan Government issued a statement condemning the “barbaric act” and calling for those responsible to be brought to justice. “Such heinous acts of terror do not represent the true values of Islam, which is based on tolerance, compassion and peaceful coexistence,” the statement said. Mr Blair, also at the EU summit, expressed “our shock at such an act of barbarism.” “This shows the nature of the people we are fighting day in, day out, around the world,” he added. US President George Bush vowed to hunt down the killers of Johnson and warned that the USA would not “retreat from the world’’, but would hunt down the killers. Computer hackers commandeered the website of a California mapping and land-surveying company to post videos of an American hostage in Saudi Arabia before he was beheaded by his Al-Qaida captors. The company that runs the website of Silicon Valley Land Survey broke the link to the videos once it learned its servers were being used to disseminate the footage, said Tim Redd, owner of the San Jose land surveying company. In a video posted Tuesday on the Internet, one of the kidnappers held an assault rifle and shouted demand for the release of Al-Qaida prisoners as Johnson sat blindfolded. Redd said he didn’t know people were using his website to access images of Johnson until a reporter from German magazine Der Spiegel contacted him. He reported the matter to the FBI. The small town where US contractor Paul Johnson grew up was in shock and mourning today after learning that he had been beheaded by his captors in Saudi Arabia. Islamist websites showed grisly pictures of his body in a pool of blood, his head placed on his back. In the USA, the Drudge Report, a popular conservative news website, also carried the photographs. Johnson, who was kidnapped last weekend, had lived in Saudi Arabia for 10 years. He worked for Lockheed Martin as an Apache helicopter targeting systems engineer. On the eve of the execution deadline late Thursday, about 100 persons gathered to pray at an event headed by Dennis Seeley, chaplain of the Eagleswood Fire Company. A US soldier was killed in a firefight with insurgents near the Iraqi city of Baquba, a US military spokeswoman said today. “A 1st Infantry Division soldier died on June 18 after anti-Iraqi forces engaged his unit with small arms fire at about 7 pm (8:30 pm IST) near Baquba,” she said. “The soldier’s name is being withheld until his next of kin are informed”, she added. It is the second account of large-scale nonpayment to surface in a week in this wealthy Southeast Asian city-state, which depends on thousands of migrant laborers from less-affluent neighbour countries to do menial work shunned by most Singaporeans. In the latest case, 400 workers from India, Bangladesh, China and Thailand were owed between $ 3,000 to $ 7,000 (Singapore) each by Wan Soon Construction, The Straits Times newspaper quoted the workers as saying. “They kept saying they will pay us, but we haven’t received anything — not even to buy food,” one worker was quoted as saying. The company, which didn’t return calls seeking comment today, has lost three government work contracts and faces numerous lawsuits, the report said without elaborating. President George W. Bush has selected 12 persons, including Pope John Paul II, to receive the Presidential Medal of Freedom, the White House announced. Two of the recipients will be honoured posthumously, while the others are invited to receive America’s highest civilian honour at a White House ceremony with Bush next Wednesday. The Medal of Freedom, established by President Harry Truman in 1945 to recognise civilians for their World War II service, was reinstated by President John F. Kennedy in 1963 to honour distinguished service in a range of fields, including arts, sports, business and science. Blues artiste B.B. 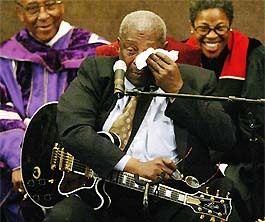 King wipes his tears while performing during the funeral of legendary musician Ray Charles in Los Angeles on Friday. Charles, who overcame poverty, blindness and heroin addiction to lay the foundation for soul music and became one of America's most beloved entertainers, died on June 10 at the age of 73 after a long fight with liver disease. — Reuters.